There is a limit to the amount of luggage you can carry on a bike! When I did my 3000 mile round trip on my CB400N, it was fitted with a luggage rack. To this rack I strapped a canvas holdall. Another waterproof bag was strapped to the tank with bungee straps. I also rode with a Karrimor 75 litre rucksack on my back! When I bought the Pan, it came fitted with a Honda luggage rack. (This is a genuine Honda part, number 08L42-MT3-B00). However, as mentioned in the Audio section, I then acquired and fitted a Givi top box instead. A visitor to this site contacted me on the off-chance that I still had the original luggage rack. Would I be interested in selling it? I was, and did. Most modern motorcycles will accept accessories such as rear carrier racks or panniers without any problem at all. They are extremely useful, especially if you wish to use your machine for daily commuting to the office and you want to carry a briefcase. The main aim of carrying anything on a bike is to keep the weight as low and as close to the centre of the bike as possible. Panniers should be loaded evenly in order to minimise any imbalance. It goes without saying that any cargo must be securely tied down! The recommended maximum load for the ST1100 panniers is 9kg per side. The total cargo weight should not exceed 27kg. Mind you, if you're riding alone you could probably carry more, as a pillion passenger will probably weigh a lot more than 27kg! A genuine Honda top box (45 litre capacity) was available for the ST1100, being large enough to carry two full-face helmets. 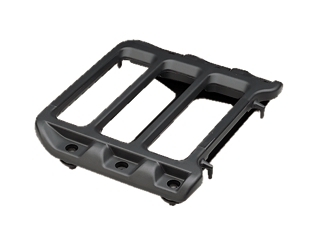 Givi make a luggage rack and several sizes of top box for the ST. These are removable and lockable, and the largest has a whopping great capacity of 55 litres! One other optional item of luggage is a tank bag. Some models of the ST1100 have wire mounting points underneath the tank cover - two loops welded into the steering head brace, and one each side of the tank under the front of the seat. Mine doesn't have these. To be perfectly honest, as I rarely ride with a pillion passenger anyway, I don't have the need for a tank bag; the panniers provide sufficient storage capacity - and on the odd occasion when I need to carry an item which doesn't fit in the panniers, I strap it to the rear of the seat with bungee cords. By the way, Honda have thoughtfully provided a couple of wire fold-out brackets under the seat for just this sort of eventuality. I'm embarassed to admit it took me several years to notice them as I had assumed they were just part of the seat support mechanism. So have a look under your own seat! If you decide to go for a tank bag, it is important that it is not too large, mounted in such a way that it does not interfere with the steering lock (or depress the horn button when on full left lock! ), and has a padded section underneath so that it does not scratch the tank cover. You could select a magnetic tank bag; but you would then need to glue a steel plate under the plastic tank cover. Also, you may want to choose a bag which is either waterproof or comes with a rain cover. There are many makes available. need not be removed in order to access the petrol cap. A tank bag could also be used to house a radio and speakers, if you do not want to go down the Autocom route. For the European market, Honda used to supply a tank bag custom-designed for the ST1100. The Honda part number was 08L56-MT3-800. This was then superceded by part number 08L56-MBT-800.